Long ago my Grandpa George Curran walked out onto frozen Lake Geneva and wandered among the fishermen who were participating in a winter ice fishing contest. As he walked about, he asked the contestants how they were all doing. Apparently, the ice fishing was slow, no one had caught anything worth claiming, and the contest folks were still waiting for someone to come forward with a catch. With a slight smile, Grandpa George sat down his bucket and turned to his fellow fishermen. “Let me show you how it’s done,” he said. Grandpa George, innovator that he was, had a secret weapon. This past weekend my dad explained to me what the invention was that Grandpa George used on the day of the contest, and though I cannot share this family knowledge, I can say that it worked. This is what happened. Grandpa George augured a hole in the ice, sat himself down on his bucket, pulled out his homemade fishing tackle, and went to work, maneuvering a lure underwater. Kaplooie! The first fish bit, and out the beauty came. Slight smile still in place, Grandpa George threw his line in again, and within a short five minutes, out came another! One can only imagine the looks on the faces of the fishermen who had been fishing all day without catching a thing. 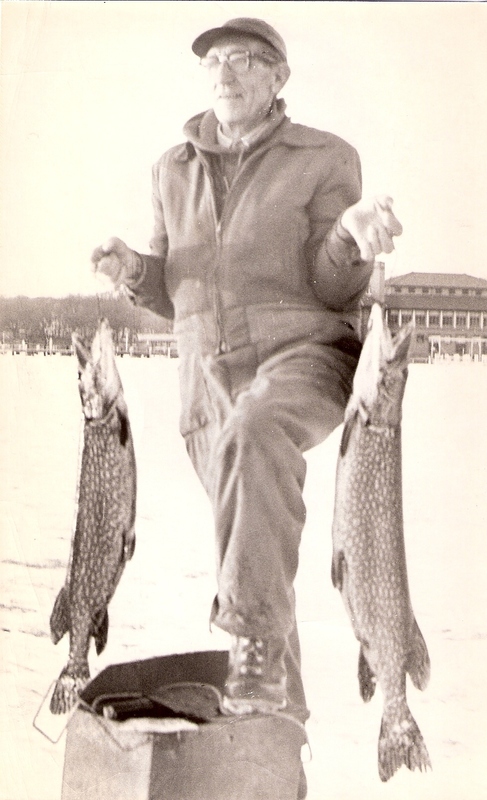 By this point the Lake Geneva Regional News photographer covering the ice fishing contest had discovered Grandpa George and asked him to pose with his two fish in hand. Grandpa was getting a little on in years, but he did it, one foot on his ice bucket as a brace while he held his heavy trophies. Moral(s) of the story…. sometimes all it takes is a little creativity to solve a problem, and sometimes the old guy does know best. Many thanks to my aunt and cousin for sharing the photo with our family, and many thanks to my dad for sharing this story. My dad, by the way, was the architect that managed the renovation of the Riviera building (shown in the photo) behind Grandpa George, which happened about 20 years after the photo was taken.